Game fans will snap up these sweet treats faster than a quarterback blitz! CooksRecipes has quality, kitchen-tested recipes for fan-pleasing desserts and sweet treats that you can count on for successful deliciousness. These cookies will give everyone something to cheer about! 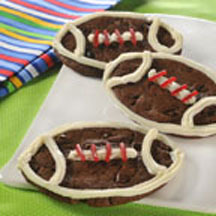 Cookies are cut into football shapes and decorated with icing and licorice for that finishing touch. 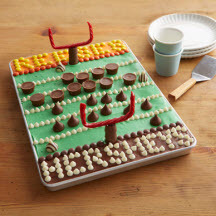 A fun chocolate sheet cake decorated to look like a football field with the two teams represented by candy Kisses and mini peanut butter cups. 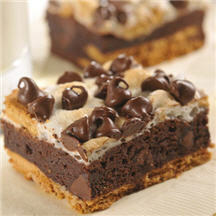 You can count on fans going back to the dessert table for s'more of these yummy brownies.